Think Pattaya is just Thailand's Sin City? Think again. Pattaya, a beach city about 90 minutes south of Bangkok, is famous for all the wrong reasons. This is true not only among foreign visitors but among Thais themselves. The very word can make people cringe out loud — why would anyone come to Pattaya, a place that makes Las Vegas look virtuous. Below, you'll find the top 14 things to do in Pattaya, Thailand, which should clear up any misconceptions you have about the city. Don't be fooled by the innocuous name of Pattaya Walking Street: Most people come here to do anything but walk. While it's true that you could theoretically just stroll through here to take photos, or sit down at one of the bars and have a cocktail, this is the place where most of what Pattaya is notorious for takes place. Be vigilant if you visit Pattaya Walking Street — and don't say we didn't warn you! Although Pattaya sits on the coast, it's not home to any of Thailand's best beaches — not on the mainland, at least. However, you can take easy day trips by boat from Pattaya pier, which will take you to islands of striking beauty. The most popular of these is Ko Lan, whose name means "Coral Island" in Thai. As its name suggests, Ko Lan is paradise for snorkelers. Other islands within day-trip distance of Pattaya include Ko Phai and Ko Sak. Beautiful beaches are the first way Pattaya bucks its reputation — art is the second. And not just any art, either. True to its name, the Art in Paradise museum features many paradisiacal scenes, depicting tropical animals, towering palm trees and water almost as beautiful as if it were sparkling before you. But it's not just a pretty face. Art in Paradise features three-dimensional art that's highly interactive, and allows you to become part of the exhibition. Needless to say, if you're looking for the best Instagram spots in Pattaya, this has got to be close to the top of the list. Tickets cost around 500 baht for foreigners, 160 baht for Thais and entry is free for children under 2. When you think of floating markets in Thailand, you usually imagine the boated canals to the north and west of Bangkok, such as Amphawa and Damnoen Saduak in Samut Songkhram province. However, if you don't get a chance to visit any floating markets near Bangkok, make sure to visit the one in Pattaya. Located in Bang Lamung about 20 minutes from the city by taxi, take a leisurely walk through Pattaya's floating market and maybe even buy some produce. Want to experience some of the Pattaya area's lush nature, but aren't feeling in a beachy mood, and don't want to eat pad Thai that was cooked on a long-tail boat? Head about 30 minutes west of Pattaya by taxi, to Nong Nuch Botanical Garden. Spotlighting plants native to Thailand, including an impressive variety of orchids, this expertly landscaped garden wouldn't be out of place in Europe or the United States. Well, except for the ornate Buddhist sculptures that dot its landscape and the "spirit houses" where ghosts from previous structures reside. Some people stumble upon Pattaya's aforementioned Walking Street after watching sunset from the city's main beach. One way to avoid such a mis-step, with all due respect to the main beach, is to get your dose of Vitamin Sea at Jomtien Beach. 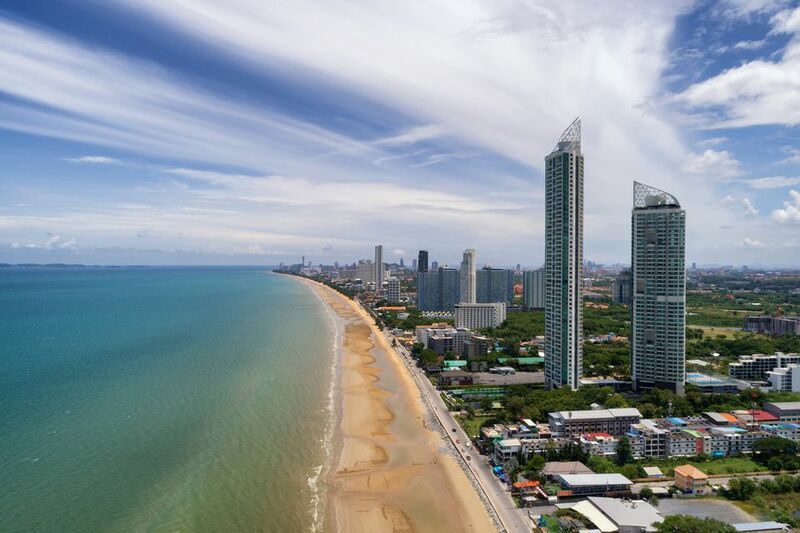 Located south of the main strip and home to an ever-increasing variety of luxury condos, high-rise hotels and upscale eateries, Jomtien is the ideal place to lounge the day away. As is the case in many bars in Thailand, the quality of alcohol served in Pattaya can vary dramatically. One way to get a clean, delicious buzz is to visit Silverlake Vineyard, a winery that's only a short taxi ride from the center of Pattaya. In addition to the opportunity to drink delicious white wine produced right here in Thailand (they make red, too, but it'll be too hot to enjoy that), you can take a tour of the winery grounds, where vines that seem more befitting of Europe and California exist amid Thailand's decidedly tropical landscape. An intricate, 300-foot tall teak wood structure that presented a mythical, impressionistic vision of human history highly influenced bu Buddhism, the Sanctuary of Truth is truly an architectural masterpiece. Located just north of Pattaya's main beach not far from Art in Paradise, the Sanctuary of Truth is a great way to pass an afternoon, or to practice your photography skills. Pattaya Walking Street is the city's best-known source of controversy, but it's not the only one. Baan Sukhawadee, whose name literally translates to "House of Heaven," is a wholesome example of this phenomenon, even if many people believe it to be distasteful. Built in 2000 by a private architect, this place is far from ancient, and arguably lacks the architectural integrity (or the ties to history) you find at the aforementioned Sanctuary of Truth. On the other hand, many tourists (especially Chinese ones, as of late) find its over-the-top colors and design flourishes interesting, as you'll find if you search social media for pictures taken here. The only way to find out how you'll feel, of course, is to plan your own visit here. Want to discover Pattaya's wide world of underwater life, but don't have your SCUBA license or don't care to snorkel? One of Thailand's best aquariums, Underwater World more than lives up to its name. With dozens of species of fish and sea mammals, including whales and dolphins, Underwater World allows you to get up-close and personal with the colorful, precious landscape that sits just off the coast of Pattaya city. This is a great Pattaya destination for families and lovers of aquatic animals. Want to see all Thailand's most important sights, but are on a time crunch? Pattaya has an antidote to that! Known as Mini Siam, this replica park just outside the city center is home to miniaturized model of Thailand's most famous attractions, from Bangkok's Grand Palace to Doi Suthep temple in Chiang Mai. Somewhat puzzlingly, you'll also find replicas of non-Thai things here, including Italy's Leaning Tower of Pisa. Note that most of the replicas at Mini Siam are walled off, which means that you unfortunately won't be able to take a picture of yourself looming above the Phuket's Big Buddha like Godzilla. Pattaya is often a weekend trip for residents of (and visitors to) Bangkok, but it can be so much more. In fact, you could easily argue that Pattaya is the gateway to southeastern Thailand, which is one of the country's most underrated regions. The closest destination to Pattaya is the island of Koh Samet, located just off the coast of Rayong city in the province of the same name, around an hour from Pattaya by bus. Traveling further down the coast takes you to Trat province and the Koh Chang archipelago, which includes the islands of Koh Mak, Koh Wai, Koh Kood and of course Koh Chang (Elephant Island) itself.